We are proud to serve you products that are made with the highest quality ingredients available. Here are just a few examples of the quality products at Ruby's. The hand-formed patty in your RubyBurger, always fresh, never frozen. Our French fries are made with the best Idaho potatoes and cooked in pure, cholesterol-free vegetable oil. Our golden brown RubyBuns are baked fresh each day and each cup of coffee is made with whole beans ground fresh for every pot. Our commitment to you is the same as our high commitment to quality in our food and service-and that will never vary. Ruby's captures all of the good feelings of America's past and present. The 1940's were a time of great trials for our country. Even in these most difficult times, Americans pulled together and worked like never before towards a common goal. That goal was to "Win the War." During this time, the American Diner was the common meeting place for many Americans, young and old, who gathered to eat, socialize, and talk about the turbulent times. Ruby's re-creates the food, the feel, and the service of this classic All-American Diner. 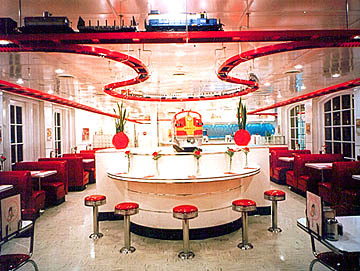 Please visit Ruby's Diner Corporate web site. © 1998 Ruby's Diner. All Rights Reserved.